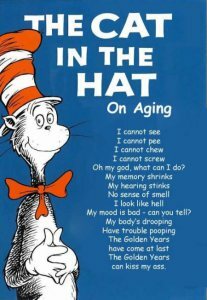 I just had a birthday on Friday past and I found this blog…I love the Dr Seuss poem … no one likes getting older but as my wise sister says “the alternative is not a good thing”…. Aging is not for the faint of heart. It takes guts to get up in the morning, mentally and emotionally feeling like you’re 35. Then you walk into the bathroom and look in the mirror. The horror strikes. WTF? When did that happen? It all happened in the blink of an eye. But I honestly don’t remember blinking.